300,000 Illinoisans to lose energy assistance | LIHEAP town hall tonight!! | R.A.G.E. 300,000 Illinoisans to lose energy assistance | LIHEAP town hall tonight!! 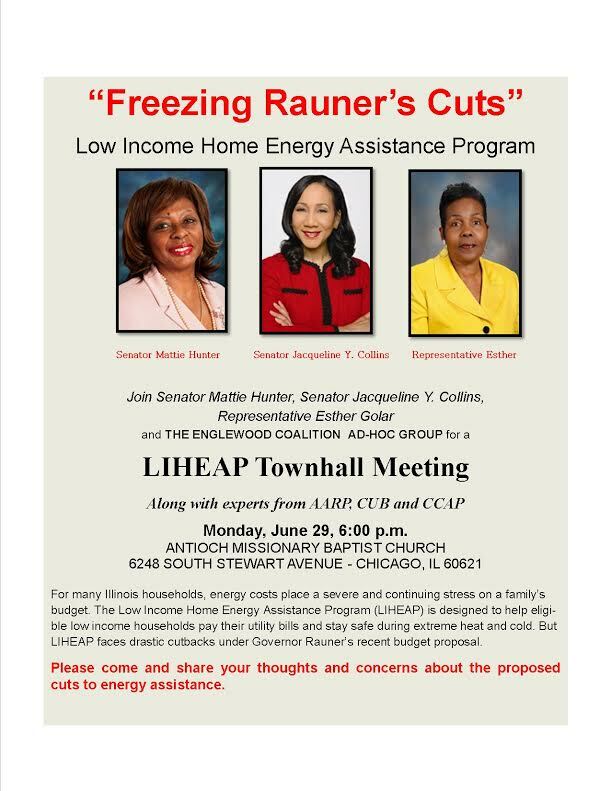 Join Senator Mattie Hunter, Senator Jacqueline Collins, Representative Esther Golar and The Englewood Coalition Ad Hoc Group for a LIHEAP Townhall Meeting tonight, June 29th at 6pm! For many Illinois households, energy costs place a severe and continuing stress on a family’s budget. The Low Income Home Energy Assistance Program (LIHEAP) is designed to help eligible low income households pay for winter energy service. The state’s LIHEAP portion comes from a tax on utilities and provides a source of badly needed revenue. LIHEAP, however, is facing cutbacks under Governor Rauner’s recent budget proposal. Please come and share your thoughts and concerns about the proposed cuts to the LIHEAP program. Also, don’t forget to call the governor at (312) 814-2121 or write to him here to voice your opinion about his attack on social services: from LIHEAP to summer jobs for at-risk youth and many more. Englewood Park Tour Kicks off June 20th at Sherwood Park!